CHENNAI: Only one in every five engineering colleges in Tamil Nadu offers accredited courses. The state's rating has slipped since 2009, when the National Board of Accreditation (NBA) said 164 technical institutions in the state offered accredited courses, among the highest in the country. In Tamil Nadu, the fee for NAB-accredited courses is higher. While a government quota seat in a non-accredited course costs 40,000, an accredited course costs 45,000. Even this has not helped. "Many institutions don't go for accreditation even after seven years because they know they will fail, so they postpone applying for the process," said IIT Kanpur chairman M Anandakrishnan. There are some colleges that are 15 years old and have still not applied for accreditation. "Accreditation is the only means to judge the quality of a course, and the only way to catch crooks," said Anandakrishnan. Educational consultant P Moorthy Selvakumaran said that though it was optional for colleges to choose whether they wanted to go in for an accreditation or not, it was important because employers want only students who have completed accredited courses and because many embassies offer visas only to students who pass out of accredited courses. 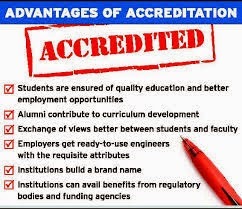 Only institutions where two batches of students have passed out can apply for NBA accreditation. Courses are given provisional accreditation for two years or a permanent accreditation depending on the scores given by the evaluating team. Institutions can go in for reaccreditation after expiry of the three- or five-year period. The NBA, set up by the All India Council for Technical Education (AICTE) in 1994, evaluates engineering and management courses offered by institutions on a 1,000-point scale based on eight criteria, including the teaching-learning process, research and development and the quality of faculty. The National Authority for Regulation in Accreditation of Higher Education Bill that makes accreditation of all courses mandatory is still pending in Parliament.